Safety Information, Help & Advice for the older person. Free lunch. 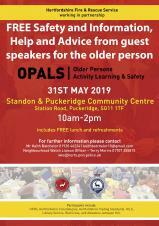 Standon& Puckeridge Community. Centre. May 31st 10am to 2pm. 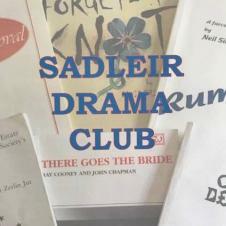 Sadleir Drama Club - "Last Panto in Little Grimley"
A One Act Play, Fish & Chip Supper, Licensed Bar, Quiz and Sketches. Tickets £13.50 each . Price for a group of 10 is £12 each. You may have seen the ongoing forecast of high winds and rain (Storm Gareth) expected to arrive today (Wednesday 13th March), affecting parts of the South East and the East of England. Towards the end of 2018 progress on the A120 Little Hadham Bypass and Flood Alleviation scheme made a number of positive steps forward. Hertfordshire County Council (HCC) is pleased to announce that John Graham Construction Ltd (GRAHAM) has been notified that they have been successful in their bid to carry out the construction works. Other advanced works are underway. The Memorial bench on the A120 in Kents Lane in memory of Mr and Mrs Mottram had to be removed by Hertfordshire Highways because of the roadworks taking place, but it was in a very poor condition. Hertfordshire Highways have advised the Parish Council that they will replace this bench and attach a new plaque onto the bench in memory of Mr and Mrs Mottram. (This is the area behind Standon High Street shops adjacent to the river). The trees planted by the PC back in January 1974 have again reached a stage in their lives where they need to be made safe as happened twenty or so years ago. There are two Ash trees that require work; one is leaning and needs felling for safety reasons, the other one needs the laterals overhanging gardens reducing. XHTML 1.0 validated. WCAG compliant. Page generated in 0.0955 seconds.